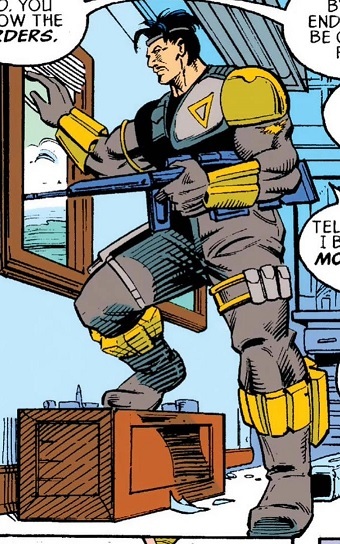 Powers/Abilities: A skilled mercenary, Rapidfire wore body armor and carries guns loaded with Teflon-coated armor-piercing bullets. He also carried grenades. History: (Cage I#11 (fb) ) - Hector spent his whole life fighting, and paid dearly for it. Eventually, he became the mercenary known as Rapidfire. (Punisher II#60-62 - BTS / Cage I#11 (fb) ) - Councilman Randolph Creed hired Rapidfire to unite the gangs of Chicago; he began recruiting gang members to his cause, supplying them with armor-piercing "cop-killer" bullets. One attempt to do so was disrupted by Luke Cage and the Punisher. (Cage I#11 (fb) ) - Through his gun-sights, Rapidfire watched Cage protect a boy from a drive-by shooting. He wanted to take down the hero right there, but the Creed representative he was meeting with ordered him to let Cage go. He vowed that if Cage interfered with their plans, he'd kill him. Later, when he learned that Cage had been hitting his operations, Rapidfire assembled his gang, including the superhuman teenagers of Trash, and used another member, Troop, who blamed Cage for his brother's death, to set a trap. Troop lured Cage to an abandoned building, where Rapidfire ambushed him - however, Troop had a change of heart, and smashed the building's fusebox plunging it into darkness. In the ensuing battle, Cage made short work of Rapidfire and his men, and Trash member Blasting Cap went berserk, causing a massive explosion that leveled the building. While Cage, Troop, Blasting Cap, and fellow Trash member Crazy Legs survived, Rapidfire's fate in the conflagration is unknown. Comments: Created by Marc McLaurin, Gordon Purcell, and Andrew Pepoy. 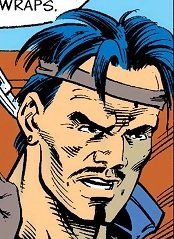 Rapidfire is neither seen nor mentioned in Punisher II#60-62, but he's mentioned as being behind the events that happened there in an editor's note in Cage I#11. The rise of so-called cop-killer ammunition was a real hot-button topic in the early '90s.